One of my hometown’s local civil organizations, TESZ asked me to help with one of their campaigns. They asked me to create a sign, poster for their annual food drive. I was provided with the paper, the final dimensions and… well, not much else. No words on the design specifics, the theme, nothing. Since my hands were not tied, I thought I’d use a design reminiscent of the 1940’s and 50’s. Something that was large and colorful. A design that is catchy enough to attract the attention of the passerby and make them stop for a moment. Since I had a pretty tight deadline I decided to use more of an outline and colors that hinted at the food staples they hope to collect, rather than a realistic depiction of specific items. As we are approaching Christmas – and this holiday is what inspired the food drive in the first place – I ended up adding a couple of Christmas glass ornaments to the design. A bit of holiday cheer will surely inspire everyone to give a little to those in need! The photos I was able to take of the end result are not the greatest (to say the least). I finished at night and could barely take a quick snap of it in our dimly lit living room before it was swept away. However, what is important is that the food drive has started and it’s so heart warming to see many have already contributed! The organization will continue to collect donations up until Christmas. 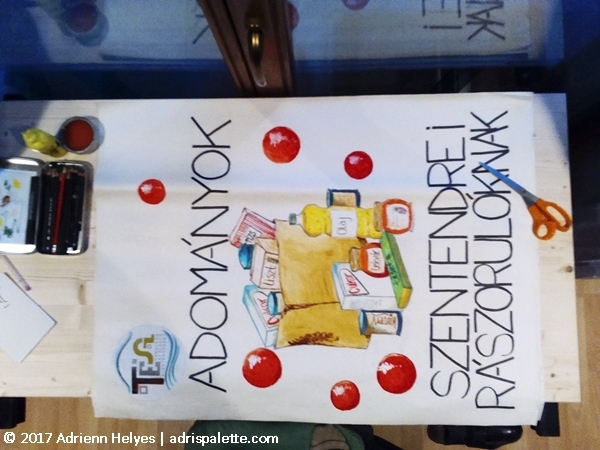 If you would like to contribute and donate non-perishable food items or cosmetics, and you live in or around Szentendre, then check the organization’s Facebook page for more details on where they will be collecting them next.